Morton Grove, IL–(ENEWSPF)–January 29, 2017. The day after Chicagoans shut down O’Hare Airport to force the release of detained refugee families and resist President Trump’s ongoing flurry of executive orders banning refugees and immigrants from Muslim and Arab countries and expanding deportation forces, over 1000 residents of Northwest Chicago suburbs rallied in solidarity with Muslims and Arabs, Jews, women, Black people, LGBTQ people, immigrants and those with disabilities. The overflow crowd poured from the basement social hall where the events began with music from the Niles West choir and singing from Cantor Jay O’Brien from Congregation Solel in Highland Park. 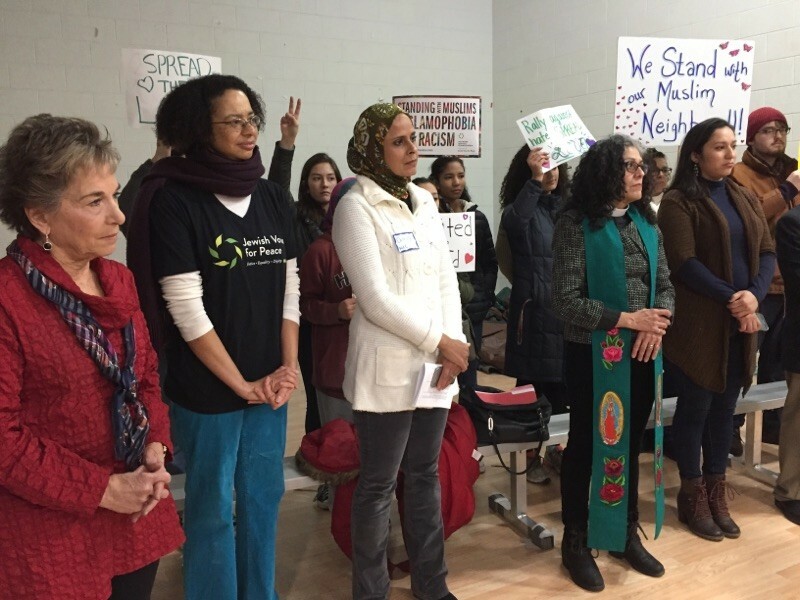 This was followed by a welcome by Dilnaz Waraich of the Muslim Community Center and Lesley Williams of Jewish Voice for Peace – Chicago. Dilnaz Waraich, Muslim Community Center: As various diverse communities around the North Shore, we raise our voices against bigotry because we have seen an increase in Islamophobia, anti-Semitism, misogyny, discrimination against African-Americans, immigrants/refugees, LGBTQ and disabled individuals that have be targeted against. Together we can have our voices heard and make a difference when we collaborate to empower our neighbor. 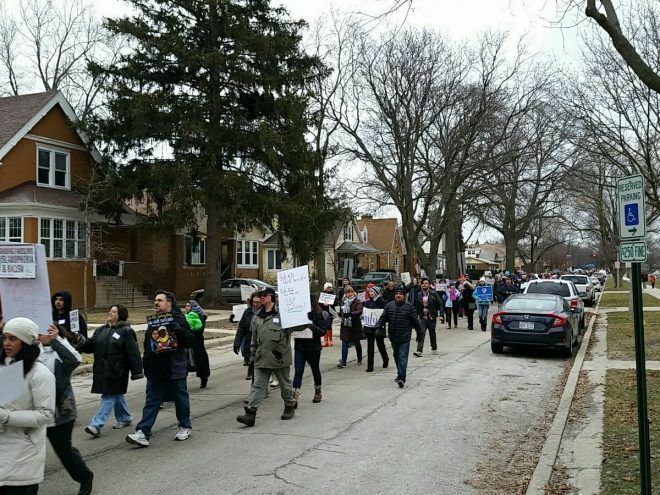 The mulitfaith, multiracial, intergenerational crowd poured into the streets for a march throughout Morton grove as cars honked their approval. 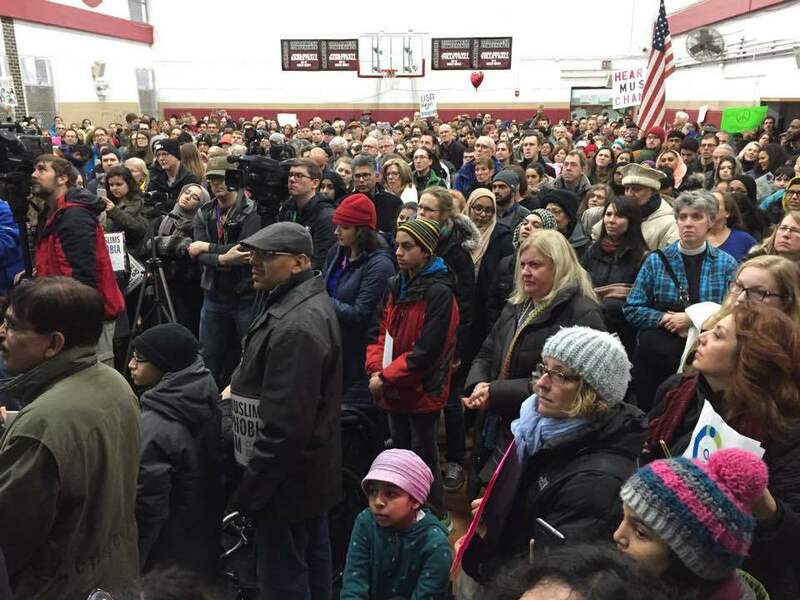 The crowd returned to the mosque where a roster of community leaders and elected officials addressed the crowd. Rep. Jan Schakowsky and State Sen. Daniel Biss expressed their commitment to fight for immigrant and refugee communities. Among the other speakers in addition to Lesley Williams of Jewish Voice for Peace and Dilnaz Waraich of Muslim Community Center were Reverend Michael Nabors of Evanston’s Second Baptist Church, and President of the Evanston NAACP; Sarwar Nasir, President of the Muslim Community Center; Pastor Liz Munoz La Reve, Iglesia Episcopal Nuestra Senora de las Americas; Nashiha Alam, Asian Americans Advancing Justice – Chicago; Rabbi Andrea London of Beth Emet; and students, including a Trans student from Niles West High School who talked about the urgency of standing together in solidarity.